This week on Armed Lutheran Radio we are joined by the dynamic duo of Gun Freedom Radio. Danny & Cheryl Todd are business owners, gun store owners, parents, grandparents, podcasters, and Second Amendment advocates. They join Lloyd for the first time to talk about running a gun store, working with your kids, broadcasting, and speaking to your elected representatives about your gun rights. And polka dots. 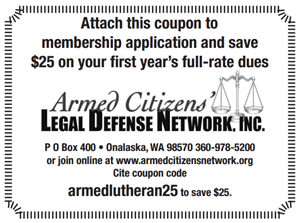 Legal Plans Starting at $24.95/month. Shop LegalShield Today! Shop Firearms and Guns at Palmetto State Armory. Dan & Cheryl Todd are he hosts of Gun Freedom Radio, a show devoted to spreading information about the right to keep and bear arms. The dynamic duo join us to discuss their businesses, their family, the DC Project, and the state of gun rights in America today. And polka dots. Aaron comments on the parking lot shooting in Florida and how to avoid getting involved in pointless disputes when you are carrying a gun. Bill reports on his vacation. Brass? Bras? Mia is talking about bra holsters and similar carry options for women. Pastor Bennett will be back with us in Episode 132. O God, as You declare Your almighty power above all in showing mercy and pity, mercifully grant unto us such a measure of Your grace that we may obtain Your gracious promises and be made partakers of Your heavenly treasures; through Jesus Christ, Your Son, our Lord. Amen.